I’ve always been interested in the Kennedy stories and this is one I did not know much about. According to the author, there’s a reason for that. This well-researched book, using access to previously unavailable diaries and letters by Rosemary and her family, outlines the rise of the Kennedy family from their arrival in Boston until Rosemary’s death in 2005. It’s difficult to read some of the things that happened or were done because the reader is using his/her modern brain. 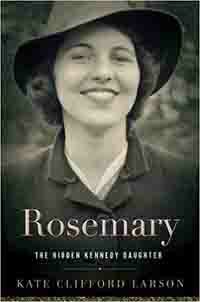 Many times, just reading of Rosemary’s birth, I almost resorted to pulling out my hair. And I’m no medic, but I know what’s wrong. Whether this contributed to her later deficiencies, I can’t say, but I’m willing to bet. As the family’s trajectory continues on the rise, through Joe, Sr.’s appointment as ambassador to Britain in the pre-WWII years to JFK’s rising political star, Rosemary’s learning disabilities embarrass and distress her parents. Throughout her early life, her mother was very active in trying to place her in environments which would encourage Rosemary’s intellectual growth, while underplaying to the schools the seriousness of her disabilities. Things only get worse as Rosemary enters her twenties and begins to actively express anger. That’s when Joe, Sr., takes a hand with disasterous results. Today, disabilities such as Rosemarys are handled so differently. But it’s thanks to Rosemary and her family’s political clout that so many of the disabilties acts ahd the Special Olympics exist today. For me, this book walks a fine line between seriously researched biography and family tell-all. Occasionally, I’d feel as if the book were more of a dissertation and other times as if it were popular writing. It all hung together, though, and gave me new insight into this family that has played such an important part of American history.